'DXing,' or long distance communications, has been a goal of amateur radio operators since the inception of radio. 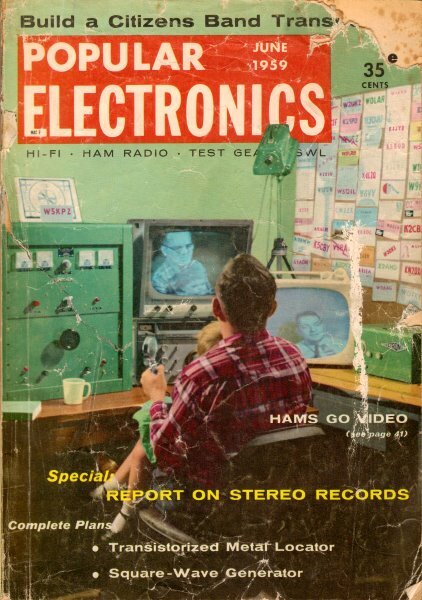 The sport is as popular today as it was in 1959 when this article appeared in Popular Electronics magazine. As you might expect, achieving success at making contacts like-minded hobbyists half-way around the world has been made quite a bit easier both by vastly improved transmitters, receivers, and antennas and by a much greater knowledge of propagation paths and accommodating atmospheric conditions. In 1959, you relied on monthly publication of reported conditions that was itself a few months old. Nowadays a DXer simply visits one of many websites with real-time status on meteorological status and current operator reports on contact conditions, equipment being used, frequency and power levels, etc. Still, though, it takes a special kind of dedication to earn the coveted "Worked All Continents" certificate. It could be that you, like so many others, feel that world-wide reception can be had only on the short waves. 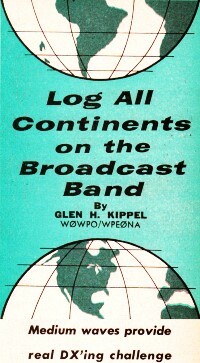 But with a good receiver and antenna, it is possible to log all continents on the medium-wave broadcast band. You may say to yourself, "That's all well and good, but I can't afford a professional receiver, and I don't have the room for a 500' long-wire." Well, while such equipment is certainly desirable, less expensive receivers can be utilized successfully. Very inexpensive D/F (Direction-Finder) receivers, such as the 12-tube MN-26C and the 17-tube BC-433F, can be purchased at many surplus stores and made to work as well as most communications receivers. This is not so surprising when you consider that the BC-433 has three r.f. stages. The "Q-5'er." Older console models usually contain sensitive chassis, and can be adapted for DX work by the addition of a Q-multiplier, sideband slicer or "Q-5'er" to increase selectivity. Of course, the accessory must match the receiver's i.f. frequency. The surplus BC-453 receiver, long known as the "Lazy Man's Q-5'er," contains an 85-kc. i.f. which is very sharp. It can be employed with any i.f. frequency commonly used in broadcast receivers (175, 262, 455 and 456 kc. being the most common) by breaking the i.f. signal lead in a convenient place, connecting to it a small capacitor and, from that, a length of coaxial cable to the antenna post on the "Q-5'er." Audio from the "Q-5'er" can then be taken from a large capacitor connected to its output stage and fed into the receiver's phono input, if it has one. If it does not, the lead from the detector to the volume control in the receiver can be cut and a shielded cable run from the volume control to the "Q-5'er." It may be necessary to connect a variable resistance in series with this lead to avoid overloading the receiver audio section. If desired, the sensitivity and signal-to-noise ratio can be boosted considerably by connecting a simple preselector (r.f. amplifier) between the antenna and receiver antenna posts. Antennas. The higher and longer antennas are much to be preferred, whether they are of the long-wire or the dipole type. If it is impossible to erect an antenna more than ten feet high or so, just remember that any antenna is better than no antenna at all, and concentrate on making the receiver more sensitive. Since few antennas can be long enough to resonate effectively at broadcast frequencies, the alternative is to scoop in as much signal as possible. If you can, use stranded antenna wire, as it has lower signal resistance than solid wire, and use double insulators to reduce losses in wet weather. Join a Club. If you have the equipment, you need to know where and when to listen. To find out what other DX'ers are hearing, the best thing to do is to join a radio club. The Newark News Radio Club, 215 Market St., Newark 1, N. J., dedicates a section of its monthly bulletin to the broadcast band. Another club is the National Radio Club, c/o Harold F. Wagner, R. D. #1, Lake City, Pa. The DX'ers' Radio Club, which was formed solely for the purpose of BCB DX'ing, also issues a monthly bulletin. 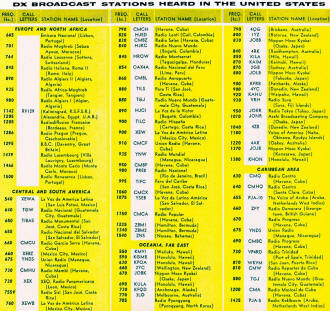 Information can be had by writing to the DX'ers' Radio Club, c/o Jim Ernst, 563 Park Ave., Scotch Plains, N. J. Using the Station List. 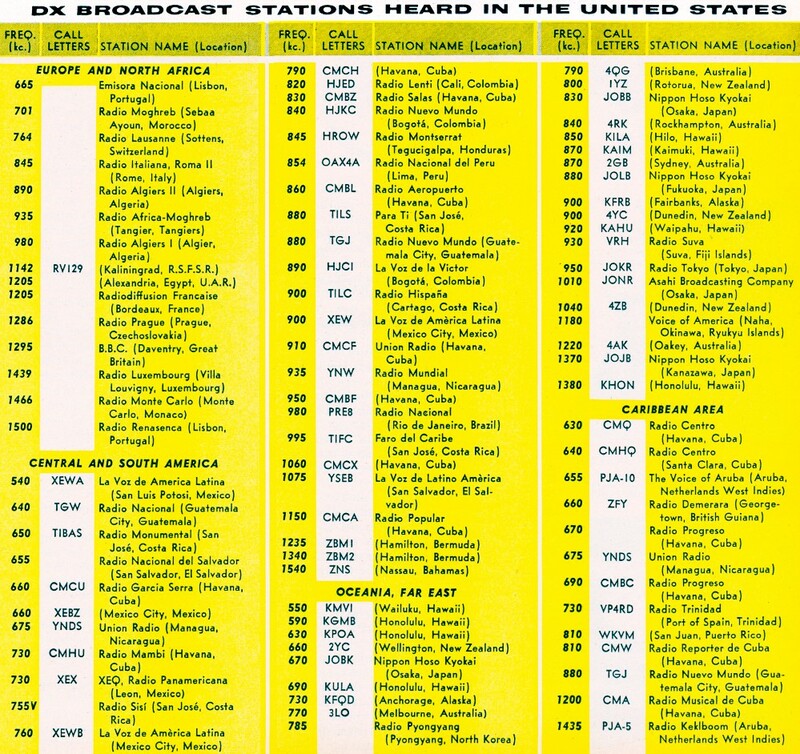 Stations which are heard well in the United States, plus some of the better DX stations which are heard regularly, are listed at right. As a rule, the European and African stations can be heard from sunset, local time, until they begin to fade out around sunrise in Europe. You can bring in the Central and South American stations until they sign off around 0100 EST. The Pacific Area and the Far East are heard best from around 0300 EST until American stations sign on and drown out the weaker DX. Stations listed as being in the Caribbean Area can be heard from about 0410 EST, when they begin signing on. And listeners in western states will find that some stations in Central America will come in better in the early morning hours because there will be less local interference. Winter is the best season for DX, although the early spring is almost as good. The reason is that the sun's rays strike the ionosphere at more of an angle and cause less ionization of the atmosphere, resulting in less ionospheric absorption. The years of low sunspot activity will provide better DX for the same reason. The next sunspot low will be 1964 to 1966, but there is no reason to wait until then because solar activity varies considerably even over very short periods.